We haven’t written anything about the annual Hat and Horns Societé New Year’s Eve party since late 2007 (and that’s a shame). The group was formed in 2000 and theirs one of the only celebrations that gives all of its proceeds to area non-profits. This year, The Bell Center and the Assistance League of Birmingham‘s Operation School Bell will benefit from tickets and t-shirts sold for the event’s 10th anniversary. The tickets are currently $125 per person, with options available to purchase tables with Mother Mercy and Hash Brown providing musical entertainment. We can’t tell if you’ll be able to purchase a shirt and have it mailed to you or not, but they’re available for $15 a piece and can be picked up the night of the event. If you couldn’t tell, today’s Alabama’s statewide primary elections. Jefferson County is also holding a special election to fill the rest of Birmingham mayor William Bell’s Jefferson County Commission District 1 seat. Politics is a pasttime in Alabama so of course there are plenty of outlets reporting on the returns. NBC 13 is providing results using their graphics package they’ve created for tonight’s television broadcast while ABC 33/40, Fox 6, and CBS 42 are providing results using periodic updates of dedicated pages for each race. Wade on Birmingham is providing a one-stop (one-page) results page while Second Front and AL.com are providing opportunities for a live chat to take place while they report returns. A new film about the 1901 constitutional convention that led to the state of Alabama’s governing document (the world’s largest) is currently in the process of being debuted across the state. 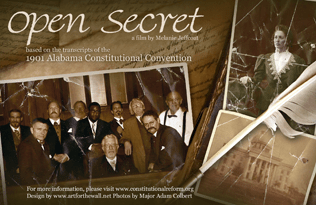 February 26th brings the film, Open Secret, directed and produed by Melanie Jeffcoat, to the Carver Theatre (overwhelming demand for attending forced organizers to move it from the Birmingham Civil Rights Institute) courtesy of Alabama Citizens for Constitutional Reform. Many people are rejoicing in the fact that the journey to the special election to serve out the remainder of former Birmingham mayor Larry Langford ends tonight – though the reasons for that relief vary depending on who you talk to. There’s bound to be endless coverage of the election results across Birmingham virtual landscape but the City of Birmingham will be posting the election results on their website starting at 7:15 p.m. tonight. You could also check out the results from various sources, including Fox 6, AL.com and Wade on Birmingham. Of course, I have my own opinions about today’s vote, but I did vote this afternoon. I hope that you did too. We’ll post a photo of the winner after it’s been determined.